Professor Jeong-Ho Lee from the Graduate School of Medical Science and Engineering was selected as the KAISTian of the Year of 2018. The award was established in 2001 and recognizes the most outstanding scholars who have made significant research and scholastic achievements during the year. 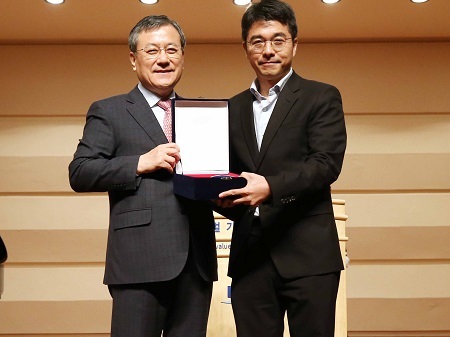 Professor Lee was awarded during the New Year ceremony held in the auditorium on January 2. Professor Lee’s Translational Neurogenetics Laboratory lab is investigating innovative diagnostics and therapeutics for untreatable brain disorders including intractable epilepsy and glioblastoma. To commercialize his technology, he established the tech-startup SoVarGen and now works as its CTO. “I will continue to strive for promoting the well-being of humanity by addressing various incurable diseases as well as developing novel therapeutics. That will be the way to promote the stature of KAIST at home and abroad,” he added.